A videotape screened in the US has shown Princess Diana saying she wanted to run away from Prince Charles and live with her bodyguard. It also shows Diana express fears that Barry Mannakee, who died in a road traffic accident in 1987, was murdered. On the tape, recorded by her voice coach in 1992, Diana said she was "deeply in love" with a man in the palace "environment". Mr Mannakee's death is being re-investigated as a result of the tape. "I was quite happy to give all this up," Diana said on the tape, broadcast on NBC. But she added: "Well not all this, at this moment, at the time, it was quite something to have all this." She continued: "Just to go off and live with him. Can you believe it? "And he kept saying he thought it was a good idea." Mr Mannakee was her bodyguard until, in her words, he was "chucked out". He died in a crash in 1987 when riding pillion on a motorcycle that collided with a car. The inquest at the time decided it was a tragic accident. 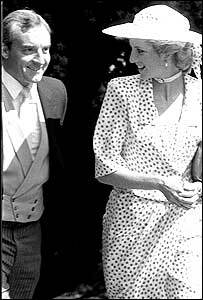 But talking of Mr Mannakee's death, Diana said: "I think he was bumped off, but there we are." That brief comment has prompted Britain's most senior police officer, Metropolitan Police chief Sir John Stevens, to reinvestigate the circumstances surrounding Mr Mannakee's accident, BBC royal correspondent Peter Hunt said. Those findings will be part of a much bigger report that he will hand to the Royal Coroner ahead of the inquest into Diana's death next year. The tape revealed more about Barry Mannakee than previous interviews Diana had given, although she never mentions him by name. "I just, you know, wore my heart on my sleeve. I was only happy when he was around," she said. Diana described his death as "the biggest blow of my life". After his death she visited the area where his ashes were scattered and laid flowers. She also said she had dreams about him. "I should never have played with fire and I did and I got very burnt," Diana said in the video. At the time the tape was recorded, after her separation from Prince Charles but before their divorce, Diana was striving to find a new role. She was using voice coach Peter Settelen, who encouraged people to talk about their lives, to find what he would call "their voice" and thus improve their public speaking. The screening is the second in recent weeks. In the first the Princess talked frankly about her childhood, marriage and the Royal family. The tapes were seized by police during a raid on her butler Paul Burrell's house and returned to Settelen this year.